Tools are used across a wide range of industries and are used to process materials of all kinds, whether forming machines are to process steel, aluminium, or plastics, or cutting machines are used for processing materials such as wood, special high-performance tools are constantly required during the manufacturing process. When not in use, these tools have to be stored in a number of different ways. Tools are frequently stored in several tool cabinets and boxes of various sizes distributed throughout the entire production area. This takes up valuable space, not to mention the fact that the parts are difficult to access. Challenges associated with a changing market means there are demands in relation to efficiency and costs. The use of modern manufacturing structures in production goes hand in hand with rising intralogistic market demands for greater storage flexibility. Tools come in all shapes, and sizes and there is a requirement to store large to smaller storage volumes in one ergonomically designed space. This means that the pressure in relation to increased efficiency also grows on traditional storage methods. 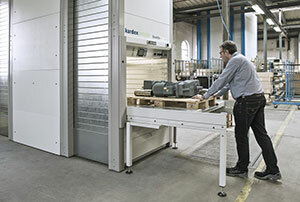 Significant improvements can be made in this area simply by introducing a central tool store with the help of an automated storage lift such as a shuttle from Kardex Remstar. The accommodation of various tools in a few different types of boxes or tool holders with precisely tailored dimensions brings further advantages, because optimal use can be made of the depth and height within the storage space. In addition, it is often the case that the instruments and tools used are extremely sensitive. Ensuring that fast and accurate access to stored tools is a must and there needs to be a focus on safe, secure and clean storage. Modern storage lift systems have an advantage here. Parts can be placed in compartments precisely adapted to their specific dimensions on the trays, thereby limiting the contact these sensitive parts have with their surroundings from the outset. In addition, there are special devices in the shuttles which guarantee dust-free and dry storage. Storing the tools at a certain temperature or drying them with warm air is also no problem. These are all options that conventional shelf-based storage cannot offer. Dynamic systems such as automated storage lifts offer more opportunities to optimise the efficiency of intralogistics processes. 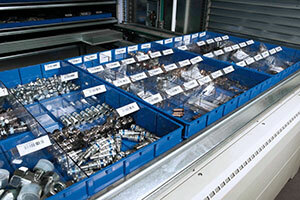 Faster and more accurate access to the stored parts is but one example of a more up-to-date storage method. A major advantages is less hunting and walking around for employees thanks to the goods-to-person principle. Then there is fast and accurate access to stored goods, controlled by warehouse management software, which avoids unproductive search times and increases picking accuracy to over 99 percent. It’s worth noting that the use of warehouse management software also permits accurate monitoring and management of the entire storage process. Space is also a major advantage as a shuttle makes optimal use of the room height and space in the building thanks to customised installation of the system. The compact design of the units can significantly reduce the size of the footprint and with ergonomically designed workspaces, which work according to the goods-to-person principle, cut the amount of time that employees are absent from work. This means it is no longer necessary to spend a long time instructing the order pickers or familiarising them with the system. Companies looking to remain competitive are recognising the requirements involved in tool storage and are switching to automated storage lift systems to manage their intralogistics processes. In the end it’s all about increasing efficiency. You can find out more about the various storage options afforded by modern shuttle solutions here. This entry was posted in News and tagged Handling and Storage. Bookmark the permalink.